My middle daughter, Lisa is also 14 (and 2 minutes older than Rene). For this Christmas, she also wanted to sew something for both my Dad and my aunt (my Dad's sister and therefore Lisa's great-aunt). We decided that a quilllow for the both of them would be an appropriate project, since Lisa has NEVER sewn anything before. Like her mother, Lisa has a great ability to procrastinate and she started the great-aunt's project kinda late in the month. Unlike her younger sister, Lisa is a very methodical, patient, PERSISTANT person and although she didn't enjoy every part of the quillow, she doggedly stuck to it and finished it in time. 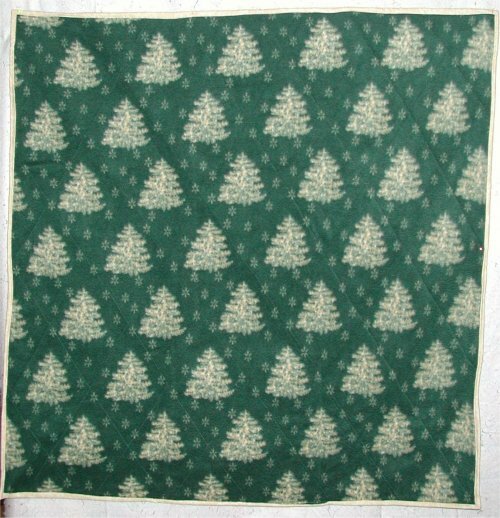 Joann's was having a terrific sale on fleece and we bought a forest green fleece with white pine trees for the quillow. We backed it with a deep green glitter fabric. The pocket of the quillow has hand-appliqued motifs cut from a pre-printed Christmas stocking panel. I spray basted the backing and the fleece together and Lisa patiently quilted cross-hatching between the pine trees. Then she started on the applique. I had shown her the machine zigzag alternative but she decided that hand-applique would be better. She has formed the opinion that anyone who hand-appliques anything is mentally deranged and is refusing to do any more of it in the future. [grin]. However, she did a wonderful job eventhough she really took her time about doing it! 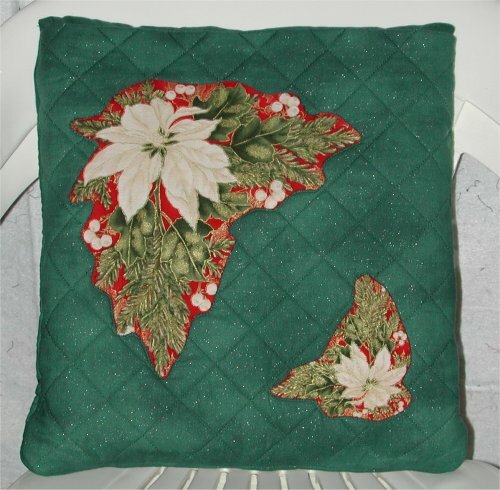 By the time the hand work on the pocket was finished, she was burned out with sewing and Christmas Eve was hard upon us, so after she sewed the pocket together, I did the cross-hatch quilting. Lisa then finished up the quillow with double-fold bias binding and mitered corners, which turned out quite nicely. The quillow for my Dad (Lisa's grandfather) is still in the 'raw ingredients' stage and hopefully will be worked on during 2003.